← In Celebration!! Get all 3 books in The Grayson Trilogy for under £3/$3 20 – 26 Nov!! Christmas means different things to different people. This is shown to great effect in The Twelve Days, a terrific anthology of short stories and poetry from the students of Central College Nottingham’s Intermediate Creative Writing course. Just Good Friends by N G Walters – right from the start of this story the descriptions are vivid, the food had my mouth watering, the violence had my stomach turning. It’s a tale of lovers, heartbreak, betrayal and revenge and has a terrific ending. 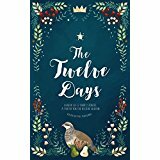 The Twelve Slays of Christmas by L J Thorne is another gut-wrenching tale. No cutesy cup-cake stories here! Set in Gotham City and featuring none other than The Joker this is the well-written start to what I can only imagine being a hugely blood thirsty longer work, and yes of course Batman is in there as well. The Man in the Mirror by Liam Foster tells the tale of a young man whose life has turned around and who’s going to have his Christmas lunch with his girlfriend’s family, who he has never met before. Christmas with the Family by Sadie Barr, sounds innocent enough, and it starts off that way too with an older lady arriving at her cottage in time for the Christmas break. However, there is much more too it, with flashbacks to events in her life and the revealing of her line of work. An interesting read indeed. The Compensation Package by Phil Pidluznyj. I have read this incredibly frustrating story before as it has been published elsewhere but on rereading it was as heartbreakingly touching and desperately sad as it was the first time. It tells the tale of a man with learning disabilities who had been made redundant and of his struggles with the Jobcentre, and life from then on. Let ‘em in by Nick Mann is an interesting story about a rotten child called Johnnie. I loved this, ‘Emotional turmoil rocked her world the way a squally ocean would menace a dinghy’ and Johnnie has had a tough time growing up. He’s back in foster care and misbehaving…actually that’s an understatement, but then Chris turns up and you’ll have to read it for yourself to see what happens. Me and Swim by Carla Eatherington is the story of Leighton, fresh out of rehab and about to start a new job, and of SWIM, who keeps leading him astray. This is a somewhat depressing tale but I really liked the way it was structured between the two characters. A Christmas Cavity by Mark Barry has been published elsewhere so it was familiar to me but it was wonderful to get the chance to reread it. Janet is a dentist, working Christmas Day and helping those on the sprawling council estate her practice is surrounded by. She thinks she’s finished for the day but then one last patient turns up, and everything changes for her. The Demise of Jersey Gaz by Alfonso Lygo is set in Guernsey where Leo has moved into his girlfriend’s flat and it covers the relationships between the tenants of the other flats, Em and Fran and Fran’s eventual boyfriend, Gaz. Leo hates Gaz but when he gets his chance to cause him some serious damage he doesn’t, taking a subtler route instead. Wanderland by Curtis Sabin. This is the beautifully told story of Amy, a young homeless woman. We see the desperation of the way she is living, and why she’s ended up where she has. One Christmas Eve an old friend bumps into her by chance and offers her a lifeline. This is an incredibly moving story and I was hooked as we headed for that happy ever after, but then as with all good stories, there’s a twist, and I didn’t see it coming. The Ladder by Novelette Williams. Chester is a writer and has the most wonderful library with a beautiful oak ladder to reach his books with, until it gets broken. His wife, Harriet, is unsympathetic, and a hideous character. Christmas arrives and although their marriage was not a happy one I did not expect what happened to happen but it was written very well and I enjoyed the part of man’s best friend, played by Lochaber. A Tasting by Kit Bachmann is a tale of fantasy and mystery with the character being someone from another world. She, guided by her Master, is on the hunt for someone suitable for the feast and when buying a coffee finds exactly what she is looking for. This terrific collection of short stories is then followed by a selection of sonnets, poetry and haikus by these same authors, who are undoubtedly a talented bunch. Over a very short space of time there has been a tremendous amount of work put into this collection both by the authors and those who have to pull the work together and get it into a state where it can be published. Everyone should be congratulated. It particularly delights me that the proceeds go to a local food bank, so go on get yourself a copy, it is Christmas after all.